So says DoctoRx (www.dailycapitalist.com) in an article*which Lorimer Wilson, editor of www.munKNEE.com (It’s all about Money!) , has further edited ([ ]), abridged (…) and reformatted below for the sake of clarity and brevity to ensure a fast and easy read. Please note that this paragraph must be included in any article re-posting to avoid copyright infringement. Gold at $20,000/ozt. by 2020? Gold traded at $140 per troy ounce [to understand the significance of the term “troy” read this (2) article] 35 years ago, shortly after it again became legal for American citizens to own it. If it had appreciated 9% annually since then, its price today would be $2,857/ozt. If it had risen as fast as the Dow Jones Industrial Average, which I place at 900 then with an estimated dividend yield over the years of 4%, then gold would today be at $7,302/ozt. If gold were to continue averaging a compounded price appreciation rate of 11.66% from the 1975-6 price of $140/ozt. until 2020, one gets $20,000 per troy ounce. If you think any of this is extreme, or is but idle numerology, please think again. Our system of money is based on debt. The Federal government issues bonds, the primary dealers buy the bonds, and then the Federal Reserve Bank of New York creates base money out of thin air by purchasing the debt from the primary dealers. This is how electronic dollars are created, and these dollars can be turned into paper currency at the request of depositors. Our paper money is a “note”, meaning a debt, though in a circular fashion it is only redeemable in its own form, namely other notes (or coins). This distinction between paper money that is also a debt obligation versus something on the order of scrip that one might find (or have found) at a military PX is at the core of much debate and confusion, but that’s a topic for Econophile or others more knowledgeable than I. Here are more numbers that I think prove the reasonableness of the above analysis. The compound growth rate of 1 growing to 50 over a 35 year span is 11.83%. Now let’s go back to gold. If the price had risen from $140 per troy ounce at an 11.83% annual rate for the past 35 years, it would now be about $7000/ozt. If we instead used the latest estimate of Federal liabilities of $61.6T and my (arbitrary) starting point of $1T, we get a compound growth rate of 12.49%. An equivalent rise of gold’s price would be to $8,612/ozt…. [and] if gold “should” be at $8,612/ozt. today to have kept up with the growth rate of Federal liabilities, an annual growth rate of only 10% from $8,612/ozt. gets the price to $20,000/ozt. by 2020. 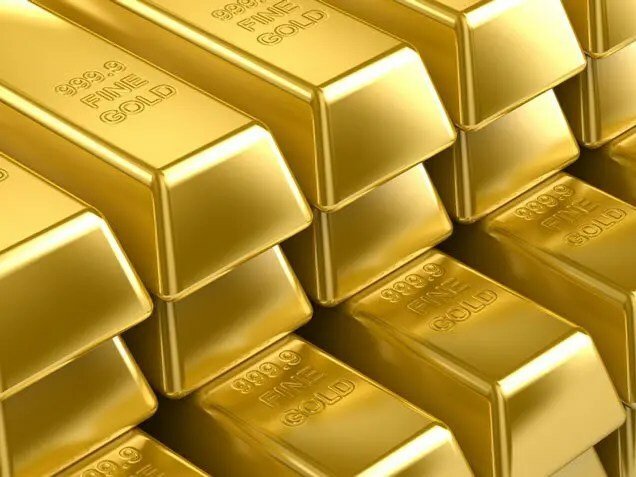 In summary, a simple analysis of compound rates of return of assets such as the DJIA and, separately, the liabilities of the sole remaining monetary and military superpower, indicate that gold may well be substantially undervalued. Should times of true panic occur and gold be re-valued to an extreme level as has occurred before (and after which the economic world in fact kept turning), prices in the $15,000-$20,000/ozt. range could become fair market prices simply by preference of investors, again without using hyper-inflated asset values as comparators. None of this is a prediction. For all I know, governments will band together to demonetize gold and will enforce that decision by force. Or gold will simply sink in price for any set of reasons, or from a “random walk”. If one is going to do as I have done, however, and allocate a significant percentage of one’s savings to gold-related investments, it is nice to believe that there is substantial real upside, not merely that of keeping up with price inflation. More importantly, the above numbers demonstrate the point that financial theorists know, which is that while buying “right” is important in the short term, buying the right asset at around a reasonable market price for the long term is the most important thing. I believe that per the above calculations, a sound case exists that gold may appreciate substantially over the long term relative to other goods and services. This potential appreciation has nothing to do with it as a commodity, in which case I would perform no such analysis. It is because gold continues to be what it has been for many years – a store of wealth – that I feel it is reasonable to think about it in this manner. There are certain things that have absolutely no equivalents or substitutes. There is only one United States of America with its dollar, “backed” by the full faith and credit of the Federal government. As of June 2011, there is exactly one generally-accepted monetary metal: gold. Previous Will Greece Default, the Euro Unravel and the U.S. Dollar be Saved? Next Update: These 90 Analysts Believe Gold Will Go to $5,000/ozt. – or More! When industry usage triples and production declines by half than you will see what you are looking for. I think 2020 is a good time for something like that to occur. http://bit.ly/pqf1Tk (Short link to graph) GOLD GOLD GOLD every where in the investor’s community GOLD remains the favorite bet. It is still considered the safest hedge against the equity. Fear of double dip brings fresh investment buying in GOLD. looks good on Technical charts. when everybody and his brother is predicting gold on an almost endless uptrend, isn’t it time to watch out! Well Robert I heard the same words of caution when GOLD formed a high of $730 and $1200, but still it’s seen marching ahead.